This 5-1/2-quart All-Clad Dutch oven is perfect for braising veal shanks, baking beans, or slow cooking choucroute under its domed lid. Because the aluminum core extends up the sides, foods cook uniformly, even though the oven is 4-1/4 inches deep. Dr. La Puma uses his All-Clad Dutch Oven 3-5 times per week. The bestseller among All-Clad’s renowned cookware collections, the Stainless line provides serious and professional cooks with all the virtues that make All-Clad’s worldwide reputation unsurpassed. Key to its high performance is a three-ply, bonded construction. Sandwiched between the exterior and an 18/10 stainless-steel interior is a thick aluminum core that spreads heat evenly across the bottom of the pan and all the way up its sides. The interior is 18/10 stainless steel, highly polished so it’s stick- as well as stain- and corrosion-resistant. The exterior is gleaming, magnetic stainless steel that works on induction as well as conventional stovetops and, with care, remains beautiful during this cookware’s lifetime warranty against defects–and beyond. This 5-1/2-quart Dutch oven makes clear why All-Clad Stainless is so popular–it’s practical as well as beautiful. 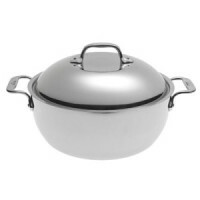 This pot is perfect for braising veal shanks, baking beans, or slow cooking choucroute under its domed lid. Because the aluminum core extends up the sides, foods cook uniformly, even though the oven is 4-1/4 inches deep (10-3/4 inches in diameter). And because the interior is nonreactive, tomatoes and other acidic foods won’t taste metallic. Each piece of All-Clad cookware features a unique metal bonding construction. All-Clad Stainless cookware sandwiches a thick core of three separate layers of aluminum between an easy-to-clean, highly polished 18/10 stainless-steel cooking surface and a magnetic stainless-steel exterior. The aluminum core retains heat and evenly distributes it along the bottom and up the sidewalls of the cookware. The stainless interior is stick-resistant and cleans easily. The magnetic stainless-steel exterior gives the cookware a gleaming finish. All-Clad Stainless also features the company’s signature “stay-cool” long handles, lids fashioned from gleaming 18/10 stainless steel, and highly durable stainless-steel rivets. All-Clad Stainless cookware is one of five collections from All-Clad Metalcrafters. Designed to work on conventional gas and electric ranges, as well as induction cooktops, All-Clad Stainless cookware is the best-selling collection in a full line that includes All-Clad LTD, Cop-R-Chef, Master Chef 2, and Copper Core.